My good friend Tatum once told me about the greatest idea. She told me how she made little cameras out of empty pudding boxes and used leftover lids for buttons and whatnot. 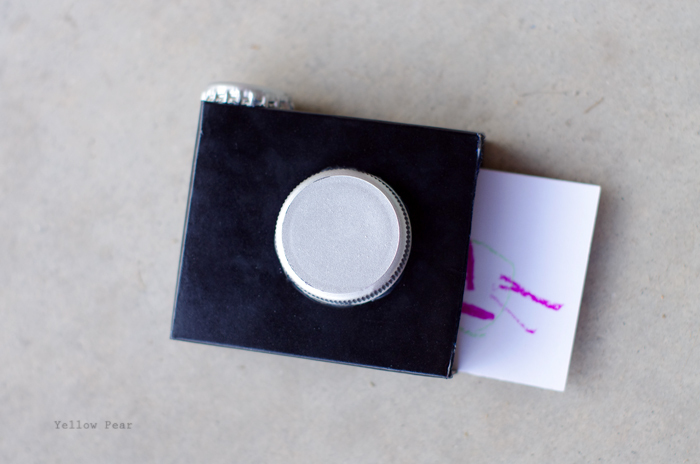 'Twas a right genius idea, so when Q and I hosted playgroup at our house recently, I made some little recycled cameras for all the kiddies. What you do is gather little pudding/jello/soup mix boxes and various-sized lids. Then you spray paint the camera parts to your liking (or according to what you have on hand, like I did). Remember to cut off one side of the box, leaving an opening. When all the parts are dry, you slap them together with a little dollop of hot glue. 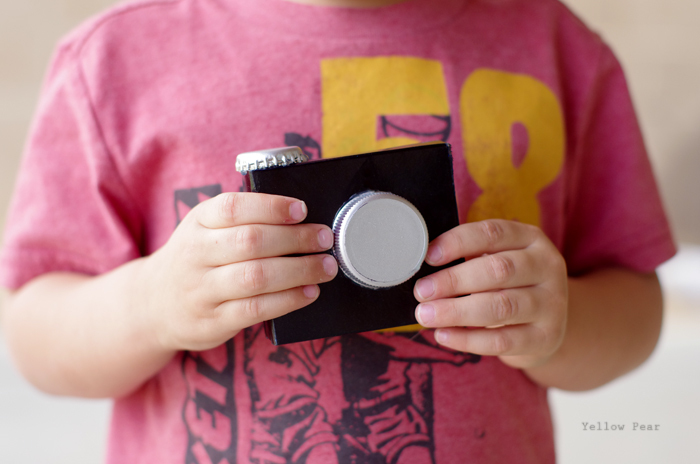 Then you give all the little kidlets plenty of pre-cut scrap paper "film" to store in their cameras. Next you set them up on the table with their scrap paper and instruct them to draw pictures of different things they want to photograph. 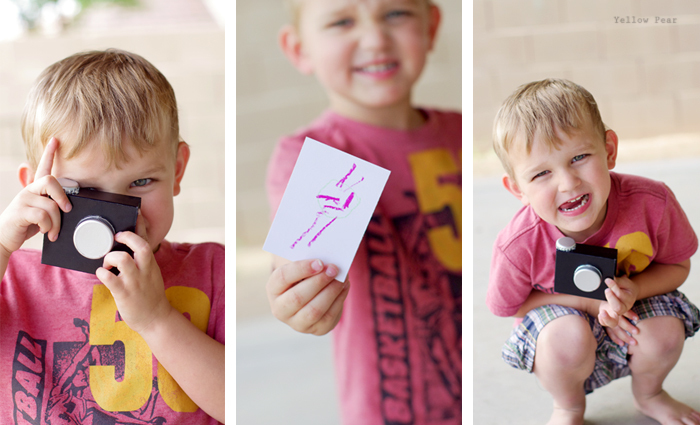 And last, you let them run around being little creative photographers. It works pretty much like a Polaroid. Only cheaper. By a long shot. Plus they don't take real pictures. Just as a disclaimer. But oh my has Q ever had fun with his. He'll say, "Lemme take a picture of you!" And you say sure and you pose. Then he says, "Oh wait, I need to go draw you first..." Then you wait patiently until he returns and says, "Say CHEEEESE!" Which you do. Then he proudly pulls your delightful, one-of-a-kind "photo" from his camera and hands it to you. And you are understandably thrilled. And so is he. Thanks Tatum, that was an awesome, awesome idea. So easy. So fun. Such a great imagination-inducer. And so GREEN! Right?! Various lids including milk jug lids, bottle caps, etc. I can always rely on you for some sweet ideas for the little ones! LOVE IT!! !